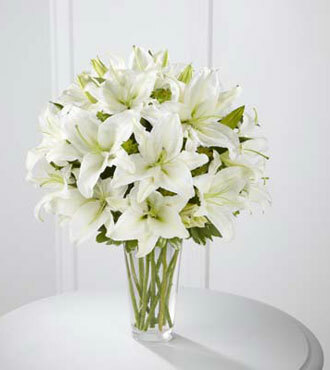 Let the comforting beauty and elegance of white lilies help you express a message of sincere sympathies. The FTD® Spirited Grace™ Lily Bouquet offers sweet serenity with every fragrant bloom. As these gorgeous flowers bloom, your compassion and support will be conveyed in the most loving way. Order today and let our floral experts arrange your bouquet in a delicate clear glass vase and have them delivered fresh to the recipient or funeral home. Be sure to include a message of sentiment with our complimentary gift card.